In Part 1, we touched on general nutrition and its affect on health and its relationship with cancer. As promised in Part 2, we will look deeper into the links between food and cancer. What is interesting to note is that cancer deaths from diet and smoking are also a result from free radical damage created by those habits. That being said the study could have just read that all cancer deaths are attributed to free radicals. The term “Free Radical” is used to describe a molecule with an unpaired electron, making it highly reactive. This highly reactive molecule is constantly looking to find its missing electron. Free radicals will steal an electron from a neighboring molecule leaving that molecule with an unpaired electron that must now do the same to its neighbor. This can easily become a cascading effect and the process can get out of control. The free radical process is part of life and as long at it is kept in check, life can continue unharmed. Free radicals are produced through normal metabolism. However, free radicals can also occur as a result of our exposure to toxins. In Part 1, we talked about the toxins we are exposed to as a result of today’s farming practices. But exposure to toxin is much more widespread than many of us think. We are all aware of the toxic affect of smoking, drinking alcohol, coffee and pollution. However, many of us are not aware, or choose to ignore, the potential toxic effects of stress and our daily food choices. With continued exposure to the toxins that create free radicals the process of electron robbing gets out of hand. Every time an electron is stolen, damage is done to the wall of the cell. If the cell is continually being damaged, it won’t take long for it to begin dying. As the dying cell struggles to survive it can mutate and as it divides it produces a twin of itself, in this case another mutated cell. Cancer is often referred to as a mass of mutated cells. According to Dr. Mona Harrison, MD, a normal cell’s electrical potential is around 6,800 angstrom. A cancer cell has a charge of only 1,800 angstrom. Every time a free radical steals an electron, the cell’s electrical potential is weakened. Otto Warburg won the Nobel Prize in 1931, for his research into cellular respiration, showing that cancer thrives in anaerobic (without oxygen) or acidic conditions. Otto Warburg won the Nobel Prize in 1931, for his research into cellular respiration, showing that cancer thrives in anaerobic (without oxygen) or acidic conditions. During one of his speeches, Warburg stated that “All normal body cells meet their energy needs by respiration of oxygen, whereas cancer cells meet their energy needs, in great part, by fermentation. Oxygen, the donor of energy in plants and animals, is dethroned in the cancer cells and replaced by the energy yielding reaction of the lowest living forms, namely the fermentation of sugar.” Free radicals cause mutations and, as Warburg demonstrated, cancer is the cell mutating to try and stay alive without oxygen. Now the good news. Anti-oxidants are molecules that have extra electrons and can donate one of those electrons to free radicals in order to keep the free radicals from stealing electrons. Anti-oxidants are available in the foods we eat. At least in the foods that some of us eat! I can’t stress enough how important raw fruits and veggies are. Some of these raw foods are super anti-oxidants, typically the darker the fruit or veggie the better its anti-oxidant potential. Numerous research studies have demonstrated that synthetic forms of Vitamins A, C and E lack anti-oxidant potential. As we discussed in Part 1, toxins cause our bodies to become acidic which strengthens the free radical process. As our bodies become more acidic, we also attract less oxygen which, boosts the free radical process. While raw fruits and vegetables are alkalizing to the body and provide oxygen; they also attract more oxygen to our internal environment. 1. Eat fruits and veggies that are rich and vibrant in color such as berries, bell peppers, raspberries, cranberries, and blackberries. 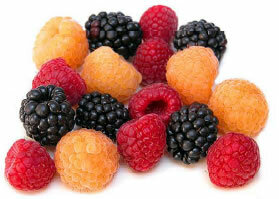 Richly colored foods tend to be higher in anti-oxidants. Be sure to eat most of them fresh and living. Remember fresh foods are more alkalizing to the body and attracts oxygen. 2. Make a smoothie every morning with your favorite fruits. 3. Load your oatmeal with 1-2 cups of berries. 4. Snack on a couple of Brazil nuts a week. Brazil nuts are high in selenium. 5. Supplement each meal with Windhawk Balanced Naturals Multi Vitamin & Mineral Formula. A daily serving offers you 70% RDI on Vitamins A, C and E. The Best part is that these vitamins are from foods! 6. Eat mostly fresh and living foods and make sure to supplement with Windhawk Balanced Naturals Enzyme & Probiotic Formula when eating cooked or processed meals. For more information about the Multi Vitamin Mineral Formula, and the Enzyme Probiotic Formula , please call (480) 603-1888.